Comelux C series - Global International B.V.
For downloads see our downloads page for the Unika, Pratika, Comeleco, Comelux Series. 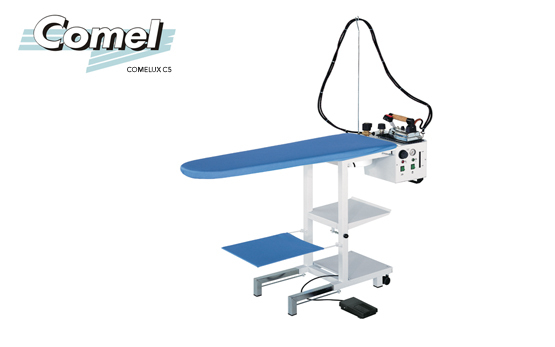 Comelux C – Universal vacuuming and folding ironing table with electric heated top and built-in motor. Complete with boiler, professional iron, motor, silicon iron mat and cable stand. Comelux C5 – same as Comelux C, except with 5 lt. stainless steel boiler, visible lit up water level gauge, steam pressure gauge and solenoid valve with steam regulation.